Paris-Nice, March 4-11, 2012. 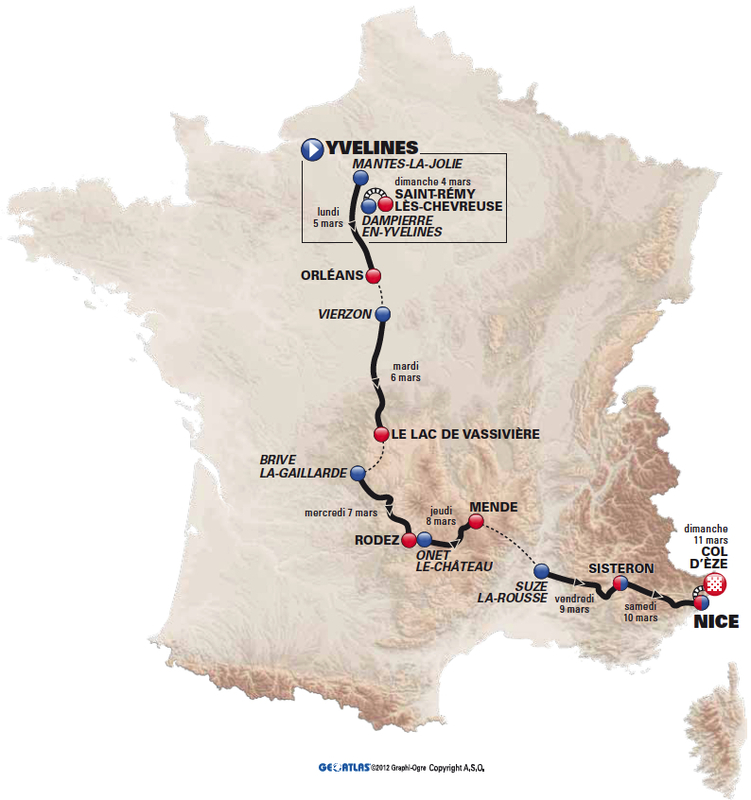 8 stages, 1,155.5 kilometres. (race website). Racing season is in full-swing, Paris-Nice has begun. 1. LARSSON Gustav 105 VACANSOLEIL-DCM 11' 19"
2. WIGGINS Bradley 21 SKY PROCYCLING 11' 20" + 00' 01"
3. LEIPHEIMER Levi 6 OMEGA PHARMA-QUICK STEP 11' 23" + 00' 04"
4. VAN GARDEREN Tejay 167 BMC RACING TEAM 11' 28" + 00' 09"
5. DE GENDT Thomas 103 VACANSOLEIL-DCM 11' 31" + 00' 12"
6. CHAVANEL Sylvain 3 OMEGA PHARMA-QUICK STEP 11' 31" + 00' 12"
7. TAARAMAE Rein 51 COFIDIS LE CREDIT EN LIGNE 11' 32" + 00' 13"
8. IRIZAR Markel 13 RADIOSHACK-NISSAN 11' 32" + 00' 13"
9. PAURIOL Rémi 146 FDJ-BIGMAT 11' 34" + 00' 15"
10. COPPEL Jérôme 201 SAUR-SOJASUN 11' 34" + 00' 15"
11. BOONEN Tom 2 OMEGA PHARMA-QUICK STEP 11' 34" + 00' 15"
12. VOIGT Jens 18 RADIOSHACK-NISSAN 11' 36" + 00' 17"
13. GRETSCH Patrick 217 PROJECT 1T4I 11' 36" + 00' 17"
14. HUSHOVD Thor 161 BMC RACING TEAM 11' 36" + 00' 17"
15. MONFORT Maxime 15 RADIOSHACK-NISSAN 11' 36" + 00' 17"
16. PORTE Richie 24 SKY PROCYCLING 11' 36" + 00' 17"
17. GUTIERREZ José Ivan 34 MOVISTAR TEAM 11' 37" + 00' 18"
18. PHINNEY Taylor 166 BMC RACING TEAM 11' 38" + 00' 19"
19. WESTRA Lieuwe 108 VACANSOLEIL-DCM 11' 39" + 00' 20"
20. BARREDO Carlos 92 RABOBANK CYCLING TEAM 11' 40" + 00' 21"